Hooray! Shock collars banned in UK! I wish I could say that these inhumane torture devices were banned universally, but sadly that is unlikely ever to happen. What I can say is that England has just now joined Wales and Scotland in banning the beastly things for cats and dogs. The details of the legislation haven’t been released yet. Sadly the British government stopped short of banning underground electric shock fences and their collars. Why one shock is allowed and another not, I don’t know. Known as e-collars, shock collars, training collars, they can deliver up to 6,000 volts to the dog’s neck, directly into the holes made by the spikes in the collar, which can last up to 11 seconds. Factor in that some electronic gadgets are faulty, and there are collars that don’t turn off at all, and you truly have an instrument of torture. Also banned are collars that make a painful noise in the dog’s sensitive ears, or squirt a nasty liquid into his face. Once squirted, this scent remains in the dog’s nose, making this a long and painful punishment. The use of shock collars is now also banned in Denmark, Norway, Sweden, Austria, Switzerland, Slovenia, Germany, and in some territories of Australia - New South Wales and Southern Australia. So civilisation is slowly creeping over the world! Science has proven without any doubt whatsoever, that associating good things with something has the effect of making that thing acceptable to an animal. The opposite is true: associating bad things with something will make the dog more reactive or fearful of the thing. Example: A dog is pulling on the lead. Just as the misguided owner administers an electric shock, the dog catches sight of a child. Now children are associated with pain and fear. How long before the dog takes matters into his own paws and bites a child to keep this dangerous thing away from him before he gets another shock? It’s simple science - not the rocket variety! What can you do to accelerate this change? And many people also think that it’s right to change an animal’s behaviour by torture and punishment. Have a look at Amnesty International and see what they think of that! If it’s wrong to do this to people - and I’m sure if you’re reading this post you agree with that! - then how can it be right to do it to animals? Be aware that people who do use them have a raft of excuses ready to pour out to you. To me that smacks of “the lady doth protest too much”. They know it’s wrong, but they try to justify it to themselves and anyone else who will listen. What it comes down to is that people like to dominate others, including animals. Some think force is acceptable. And making their own life easier at the expense of others’ rights and dignity is ok by them. 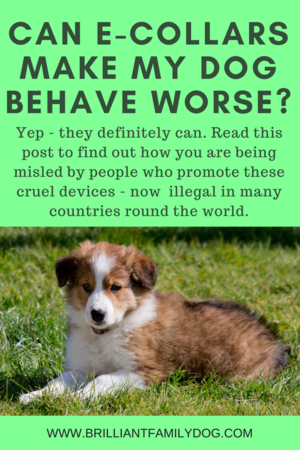 I’ve had a few emails recently from websites who promote these nasty devices, and other collars which I would consider cruel or aversive. They offered me money to advertise them on Brilliant Family Dog. How desperate are they? There’s no way I’d advertise them - “not even for ready money” as Oscar Wilde put it! You can rest assured that you will never find cruel or aversive, punishing devices or methods promoted here! We know that the results we want can all be achieved by kind and gentle methods. Yes - it sometimes may take longer, but we’re not just looking at the result: the journey itself is enjoyable. With your own family it’s the daily give-and-take that creates the abiding love and comfort that drives us to make family groups. We don’t just want the perfect, finished, child (or husband!). We live the process daily and enjoy what it brings to our relationships. And that is what I do with my pet animals too (and my farm animals when I had them). It’s the process of training, growing understanding, mutual appreciation - love - that is what we want in a relationship with our animals. Taking a shortcut to the desired result cuts all this learning out. What people miss by doing this! Sadly man has devised other nasty things for the animals we choose to share our homes with. Reminiscent of the slave trade collars long since banned, the “prong” or “pinch” (what a euphemism!) collars are also promoted for a quick fix for any dog behaviour problems. These collars have spikes on the inside that dig into the dog’s neck. “Oh, it doesn’t hurt him!” the deluded owner may say. Again - try it on someone you love. Keep in mind that dogs’ necks and throats are physiologically identical to our necks and throats. All the components are in exactly the same place as ours are. The only difference is a light bit of hair-covering, soon worn away by the use of these collars. If you need evidence that the people who use these collars actually know that they’re wrong and demeaning, know that there are now disguised collars available. From the outside it looks like a pretty collar. Inside are the rows of teeth. Despicable. So to end on a happier note - people are now realising how wrong this all is, and governments are taking action to ban their sale and use. What else can you use to get the results you want with your difficult or challenging dog? Check out our free courses and start learning a new way of working with your dog which is pleasurable for all parties. Watch your dog blossom! You could start with this one which gives you simple kind and painfree "recipes" to change aspects of your dog's behaviour which you don't love.